"It's not about me, it's about history," Nakamura said. Wow...any chance we might be getting ahead of ourselves here? The Boylston Grand Prix (see previous post by Jason Rihel) was inaugurated with a fine tournament on Saturday, Jan 29, which drew 29 players. FM Chris Chase won the Open Section with 4 of 4. 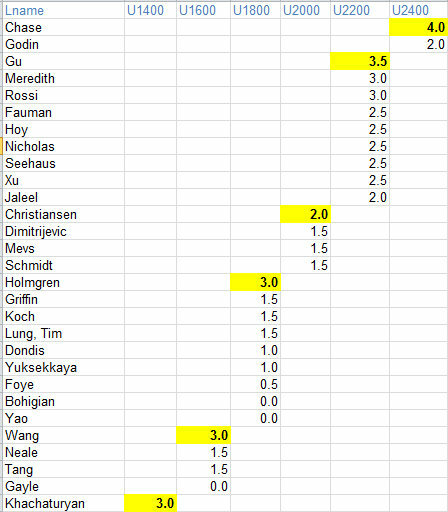 Christopher Gu followed with 3.5.
and Tian Rossi with 3. The Open Section had 23 contestants. Bob Holmgren, Vlald Khachaturyan, and Bowen Wang shared the U1800 honors with 3. 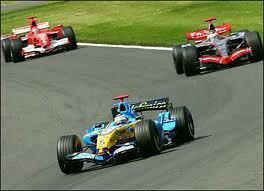 But, as Jason states in his comment, for the Grand Prix, what is important is standings within the classes. After the first event, here they are --- revised from an earlier version to reflect the comments about not counting 1/2 point byes. Every month this year, there will be a Grand Prix event. This Saturday is the first one. Over the course of the year, a player will accumulate points in every grand prix event, just like a regular tournament- 1 point for a win, 1/2 point for a draw (1/2 byes will NOT count; forced 1 point byes WILL count). At the end of the year, the person in each rating category with the highest total score over the whole year will win the prize, a modest gift certificate that is based on the number of entrants. Your rating class will be based on your first Grand Prix tournament rating. For example, if you are a 1700 player this Saturday, you will qualify for the Under 1800 section, even if your rating soars to 2100 or crashes to 1400 during the year. At $7 for members, and $10 for non-members, it is the cheapest tournament you can enter, maybe anywhere in the country. Let's face it, for most of us, the cash prizes are not why we play. Most of us just want to play some high quality games that will get rated. The entry fees for this event are set to cover the USCF rating fee costs and our general weekend tournament upkeep, and little else. We hope people will see this as a chance to play cheap rated games for the fun of filling a weekend with chess without expecting a cash payout. The gift certificates at the end of the year will be modest-- the winners will probably get your entry fee over the year back, but don't expect a big windfall at the end. We will try to keep a running tally of who is leading each rating category over the course of the year. Hopefully, a few neck-and-neck races to the end will be fun to watch. Naturally, the more Grand Prix events you play, the greater your chances of winning! 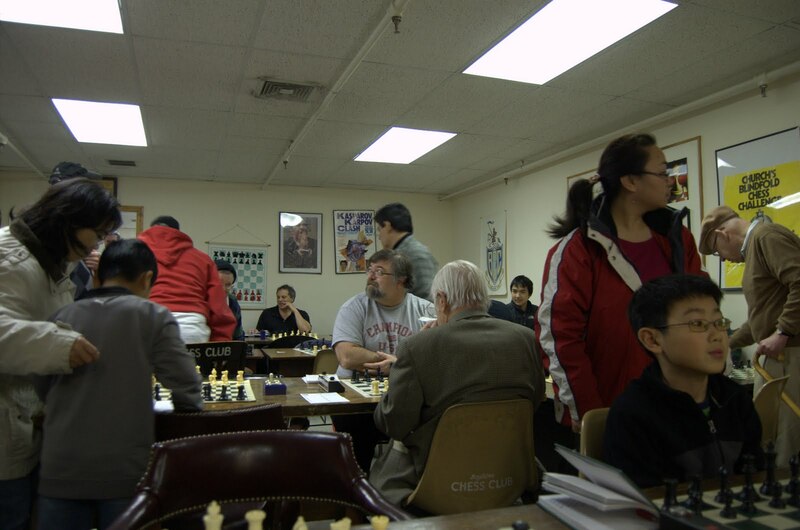 Feel like you are in chess heaven at new club in Norwalk01.21.2011 10:31 a.m. It's only been a few weeks since the soft opening of the Chess Club of Fairfield County, LLC, at 710 West Ave. in Norwalk, and its directors are already getting overwhelming positive feedback. "We challenged a chess club from New Britain. They brought 12 guys down and played 12 of our guys. And one of them commented that he had `died and gone to chess heaven.' And that's exactly what we are going for," said Melvin Patrick, club director. "This is what every chess player dreams of and what we've talked about for years." Patrick's partner in the club, Daniel Lowinger, a Chinese, English and chess teacher at the Pierrepont School in Westport, grew up in the 1980s and '90s playing chess in school cafeterias, city parks and church basements. He said he always wondered why even distinguished chess players found themselves playing in less than glamorous conditions. As he grew older, he envisioned a venue that was equal to the task of being home to all the different ways in which people engage chess. "We've called ourselves the chess Diaspora -- we would meet all over, McDonald's, wherever people would have us. We'd go anywhere," Patrick continued. Anywhere also included the community room at the Norwalk Police Department, Barnes & Noble and libraries. 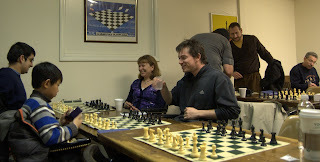 "Now we have the club on West Avenue, and it's custom designed for chess and for chess players of all ages, for the study of chess, for instruction, casual play and tournament play ... So often at scholastic events, parents find themselves sitting in cold hallways while their children play. 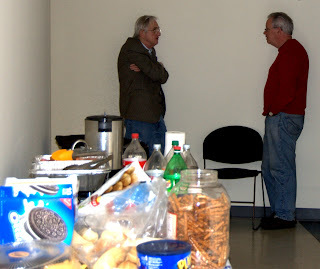 We offer comfortable lounges, a library with classic and modern chess texts and a break room," Patrick said. 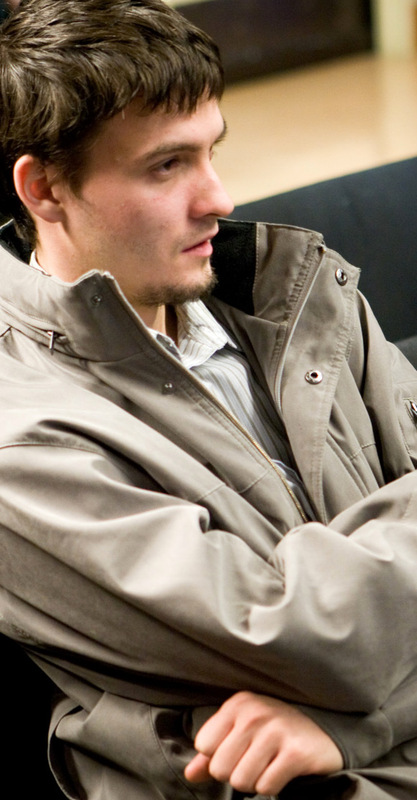 Patrick, a Norwalk resident, has been bringing chess to the local community for years. He founded Fairfield County Chess, the United States Chess Federation's Connecticut affiliate and has 16 years of scholastic chess under his belt. He's developed chess curriculum for the Norwalk Housing Authority, the George Washington Carver Center, and is a chess instructor for the Norwalk Library. 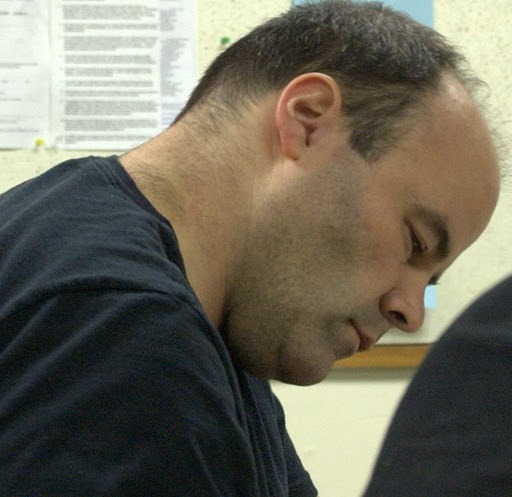 Lowinger, also a Norwalk resident, is the scholastic director at the Chess Club of Fairfield County. Among the offerings at the new chess club is a scholastic enrichment program. Parents can send their children four days a week to the after-school program featuring a curriculum created by Lowinger. Children will not only learn the rules and strategies of chess, they will develop skills with wide academic application: thoughtful analysis, creative planning, pattern recognition, logical reasoning, patience, concentration and abstract thought. Lowinger has taught at the Pierrepont School since 2006. 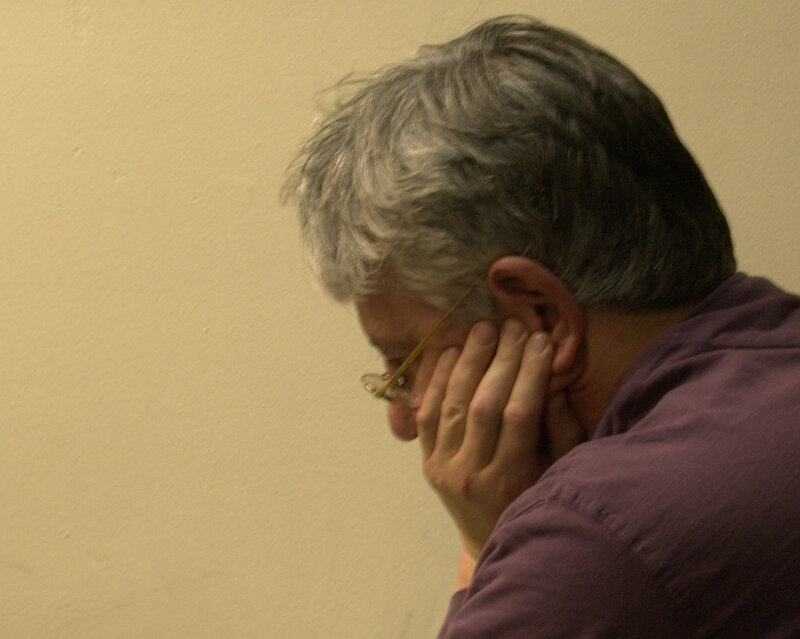 He started a chess club at the Westport school and it grew as he reached out to other schools to compete against. Now Lowinger is looking forward to growing membership in the Chess Club of Fairfield County. "We have a lot of people on our contact list who have been coming to our events for a while ... We are having our first kids' tournament at the West Avenue facility for k-2 on Sunday. The following weekend we are hosting one for kids in grades 3-5. As our regular programming starts to take off and people who are familiar with us start coming through our building, hopefully that will grow our membership," Lowinger said. 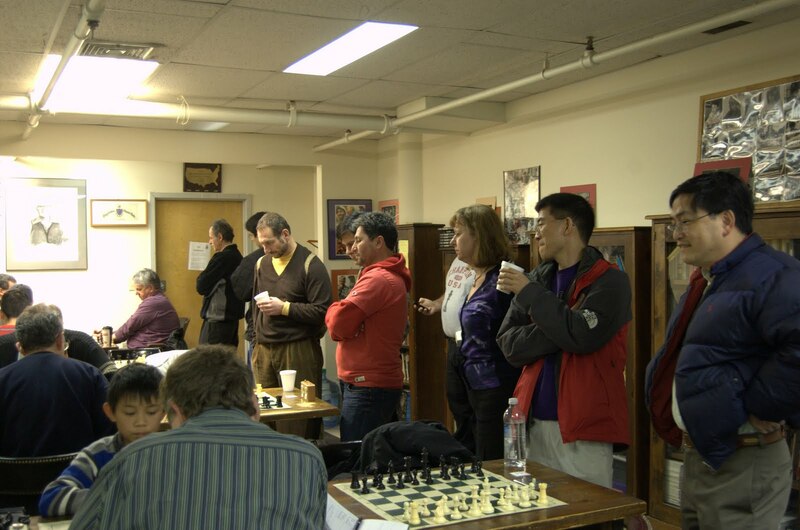 Among the regular programming on tap for people of all ages, in addition to tournaments, is private instruction, group lectures and chess camps. Recreational services include casual play, United States Chess Federation-rated tournaments and team matches. The center will be open from 5 to 10 p.m. Monday through Friday and on the weekends from noon until 10 p.m. 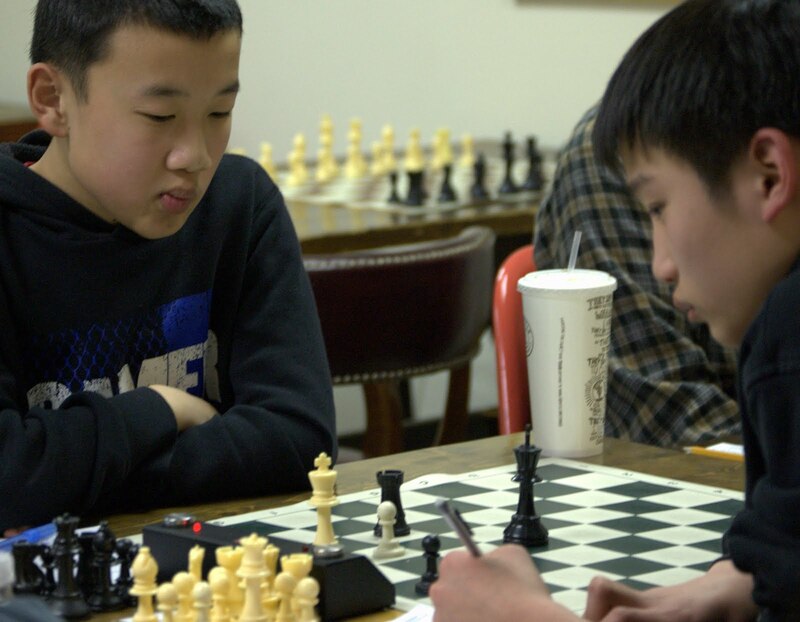 Both directors promise that chess offers something for everyone if they just give it a try. "We have players from age 5 to people in their 80s. That's the great thing about chess. Not only can people of all ages play, but then can play each other. A 5-year-old can play an 80-year-old. Your strength is not determined by your age. There are young players better than I am. Age is not the driver in what determines how strong of a chess player you are," Patrick said. Lowinger believes one of the things potential chess players would be most surprised about is that there are a varied set of skills that they can bring to the game. "It's not this one set of skills and you are either good at it or not. Something that I have come across a lot with adults that seems to be a misunderstanding is they think of chess as utilizing a singular type of skill," Lowinger explained. 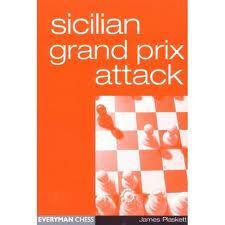 "For example there seems to be an association with chess and mathematical skills. "I am terrible at math. I mean I practically flunked out of math in high school, and when I went to college, one of the reasons I chose the college I did, is it didn't require me to take any math at all. And I am one of the best chess players in the country." The game of chess is played on a checkered board by two players, each with 16 pieces, whose object is to checkmate the opponent's king. Each player begins with a king, a queen, two bishops, two knights, two rooks or castles, and eight pawns. Lowinger pointed out that since chess is such a complicated game, players can really approach it from many different angles. "For example, some people are good at literature, and one way to play chess is to construct a narrative about what you are doing. You can be very successful with that approach," Lowinger said. Lowinger began his journey to becoming one of the best players in the country at the age of 5, when his dad began teaching him chess moves. "I was very lucky that in the town I grew up in, Great Neck, Long Island, there was a really serious chess club that met every Tuesday night just a few blocks from where I lived. So I started going there and meeting lots of friends and playing really seriously and it kind of took off from there," Lowinger said. "What I liked about it then, and what I still like the most about it, is the diverse friendships I am able to make through chess. It's really amazing. 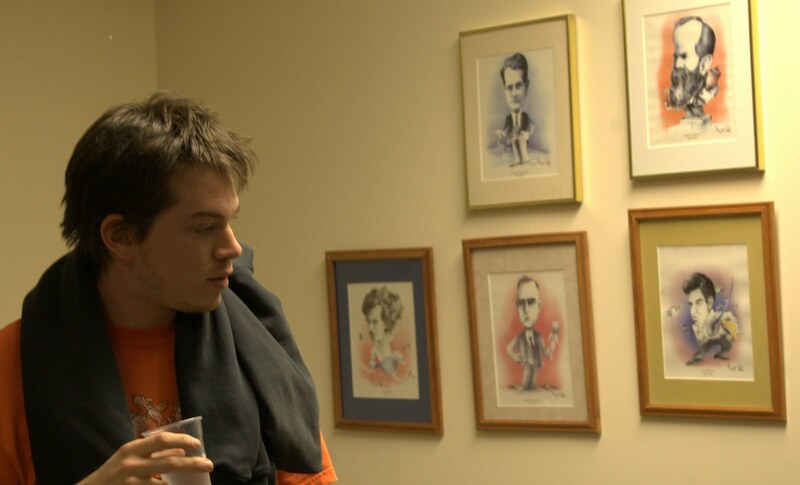 All sorts of people are drawn to chess from all kinds of backgrounds. It doesn't matter how old you are or what your politics are or what your financial situation is like. As a kid that was really exciting, I was meeting all kinds of different people. But the one thing that connected everyone was the chess." Lowinger is a USCF-certified life master, the highest certified national title. The USCF awards the national master title to any player who reaches a rating of 2200. Less than 1 percent of rated players hold the title. A life master is a national master who has played 300 games with a rating over 2200. Lowinger said the best player in the world is rated at around 2800. 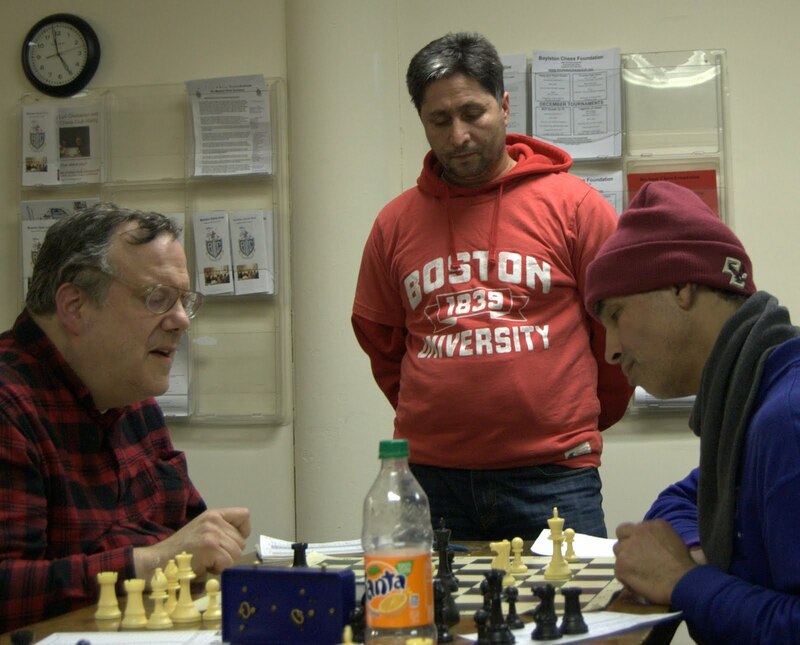 Like Lowinger, Patrick can't remember a time when he wasn't passionate about chess and he wanted to share that passion with kids who went to the Carver Center and who lived in housing operated by the NHA. 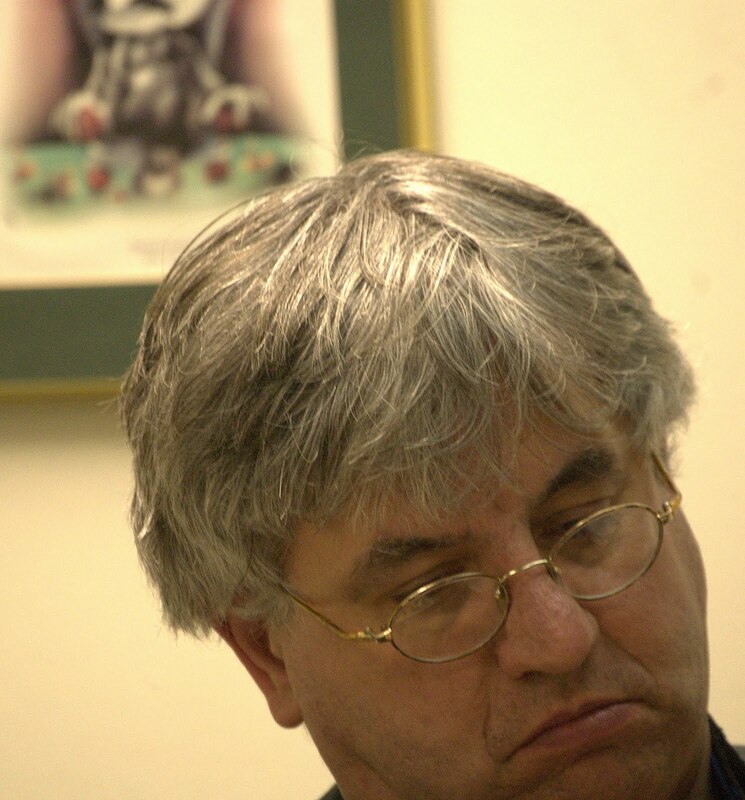 "I have always found it to be enjoyable, accessible and productive for children to learn....What got me involved in tournaments was I began working with the Norwalk Library some four or five years ago and met Cliff Potts and the late Robert Musicant, who started chess at the library. 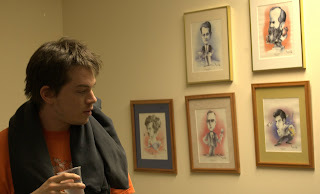 (The library has since named the chess room at the library after Musicant.) 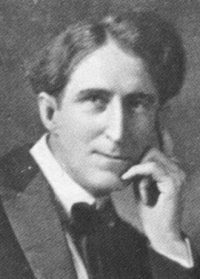 Prior to meeting those to gentleman I had a full life and many interests, and then it was pretty much all chess, all the time," Patrick said with a laugh. "There hadn't really been any quality tournaments around so I started organizing more of them. It was something I wanted to do for chess. I reached out to and attracted some of the best players around the country. We also had international grand masters coming to the Norwalk Library to play chess." Both directors pointed out they have reached out to Scrabble players in the area in the hopes the club can also host some Scrabble tournaments. "We are pretty flexible," Lowinger explained. 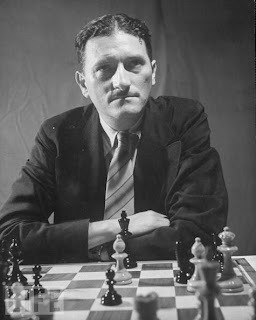 "One of the differences between our club and other chess clubs out there, not that there are very many, is that the other ones that I know of kind of impose their programming on you. You go there and you have to do whatever is on the schedule. Where as that isn't really our concept. Chess players are sort of a vagrant group, they kind of wander from place to place looking to play and we just wanted to give people a home and a place where they can settle in. Beyond that, we are very flexible. If a group of our members wanted to create an event, we'd be very open to that." He also pointed out that you don't have to be a member to use the club. People can purchase day passes as well. One of the things Lowinger would like to see happen -- and he has already started working on it--is to get a strong women's chess program going. "What happens with chess is women will come to a chess club and there is such an overwhelming percentage of men that they'll gradually kind of move away from it ... Maybe we will do a mother/daughter class ... I was interviewing one of the women's chess masters recently -- she's one of the best players in the country, and she was really interested in doing a program here. "It tends to be viewed as a man's game, and I would like to see that change/evolve." Regular membership at the club costs $300/year. Scholastic membership (18 and under) costs $420 a year. Family membership (2 adults and 2 scholastics) costs $1,140/year. A senior membership costs $180/year. A day pass costs $10 a day. No other champion has been the subject of more heated debate, or been more mythologized than Bobby Fischer. But despite this never-ending interest in him and his games, until now scant information has been available about who he really was as a person. That is about to change, with the publication of Endgame, Bobby Fischer’s Remarkable Rise and Fall, by author Frank Brady. It is certainly thrilling to relive Bobby’s formative years, the part of the story many chess players are already familiar with. Brady does a fine job of retelling Bobby’s early life and fight for the World Championship. He also manages to include new details, such as the fact that Bobby was secretly visited by his mother Regina during the 1972 championship match against Boris Spassky in Reykjavik. The real value in this book, however, comes from Brady’s reporting on the later stages of Bobby’s life. Starting with the appropriately-named chapter “TheWilderness Years” Brady guides us through the decades, from a small, barren apartment in Pasadena, to war-torn Sveti Stefan, to tense border crossings in Eastern Europe, to the inside of a Japanese holding cell, and finally to his ultimate resting place in rural Iceland. Brady’s research is impressive, and from countless interviews, anecdotes, and never-before-seen documents the outline of a person’s life begins to emerge. Like everyone, Bobby was complicated and comprised of many personalities. He could be charming, but was also consumed with hate and vitriol. He was generous, but also self-centered. He made many friends, but eventually turned on most of them. He had an unending passion for chess, yet never played again seriously after winning the world title, save for a single return match against Spassky. He also infamously became militantly antisemitic, and espoused the worst kinds of hate speech. Reading the details of Bobby’s Life is like studying a difficult chess problem. Why would someone who was seemingly so obsessed with personal wealth turn down virtually every offer – collectively worth as much as ten million dollars – after becoming World Champion? Was Fischer truly afraid of losing his title to Anatoly Karpov, leading him to abandon his title, or was he standing on principle? The answers to many of these questions have gone to the grave with the eleventh world champion. Brady’s contribution is that we now have more facts about his life than ever before, and some of these questions are coming into clearer focus. Several misconceptions about Bobby’s life are also dispelled in Endgame. For example, despite numerous reports to the contrary, Bobby maintained a close relationship with his mother until the end of her life. Also, he was hardly the idiot-savant figure some have portrayed him as. In reality, he spent the final years of his life voraciously reading tomes on world history, philosophy, poetry, and many other subjects. He became a learned man, albeit in his own way. I strongly recommend you read Endgame for yourself, and see which Bobby Fischer you find. If you would like more information about Endgame, listen to these audio clips by author Frank Brady. You can also read the first chapter online, and if you plan on being in New York in the coming weeks check out these book signing events. on tournament on Saturday, Jan 22. 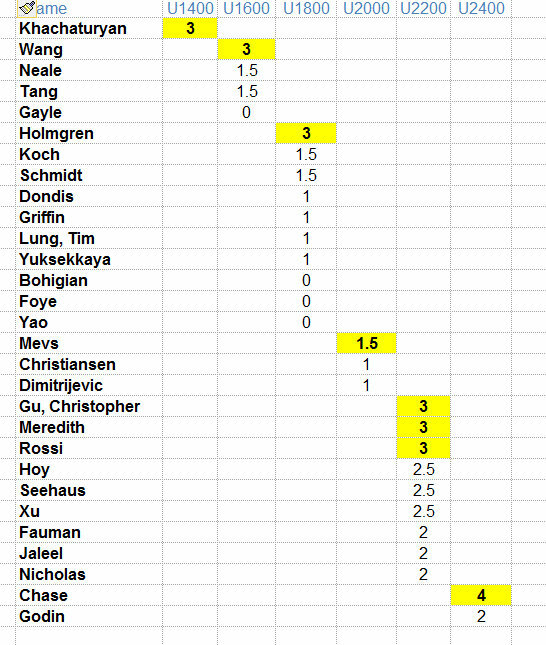 IM Marc Esserman and NM Andrew Wang tied for 1st with 3.5 of 4. 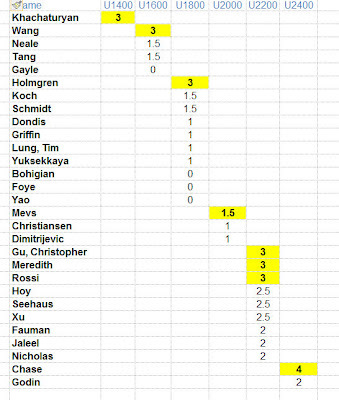 Bernhard Seehaus and Mika Brattain each had 3, and then came FM Chris Chase, Tony Blum, Darwin Ding, and Greg Koch, each with 2.5. But we can promise a warm beverage, first one is on the house! Game/25, 10s increment 4-round swiss. Not rated. Entry Fee: $15, Members: $12. IM/GM/SM Free. Prizes: $240 based on 20. Open, Under 1900. Game/70, 3-round swiss. 2 sections: Open, under 1700. Entry Fee: On site: $20, Advance: $15. IM/GM Free. Prizes: $300 based on 20. See below for Online Entry. Better late than never. I was archiving old emails and found this news which we never published. Sorry for the delay, but a great achievement. 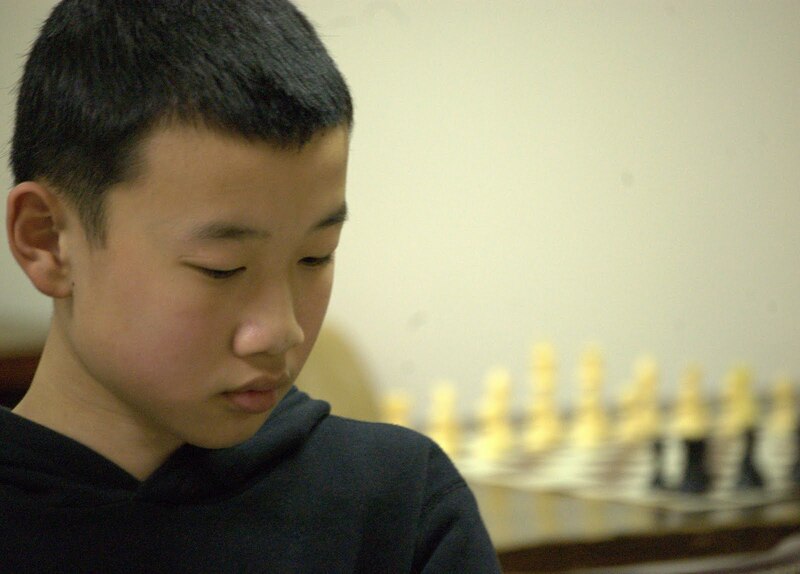 I am sending the photos attached to let you know that Max Lu won first place in the Junior High Section of the 2010 NY State Scholastic Chess Championships held on February 27 and February 28. There were 362 players in seven sections while there were 61 competitors in Junior High section. Comparing to those excellent players in BCC, Max should be more humble and this is just a small step. Max told me that the regular tournaments in BCC help him improve a lot. I cannot thank Bernado, Chris Chase and the BCC players enough. 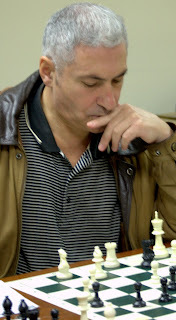 The ever-popular event drew 39 players, 18 of whom paid only $8 through the paypal option, making this one of the best chess bargains in the area. We in the chess world saw computers trump humans in our favorite game more than 10 years ago. Soon, will fans of Jeopardy! witness the same? The long-awaited match up between the world's best Jeopardy! contestants and IBM's Watson is coming in February. Judging from this news story and the following video, the 'test' rounds are not looking good for the flesh and blood set. The Watson project is IBM's long-awaited follow-up to their Deep Blue project, which defeated Kasparov in a chess match in 1996. Despite that famous victory, Deep Blue was essentially a failure for IBM -- it turned out that all the specialized chess-playing hardware and software was not readily adaptable to "real-world" problems. They turned to tackling one of artificial intellegence's most challenging problems-- the ability to flexibly work with the complexities of real language. Jeopardy!, which combines word play, cryptic clues, and trivia, embodies this problem perfectly. And this time, the real-world applications are nearly endless. Imagine a voice-responsive Google that answers complex human questions, or a call-in directory that no longer requires pushing 0 to speak to an operator. I imagine that they are very close to satisfying the Turing Test, as well. Stay tuned as we continue to cover Watson's attack on Jeopardy! As chessplayers, we understand how this goes. 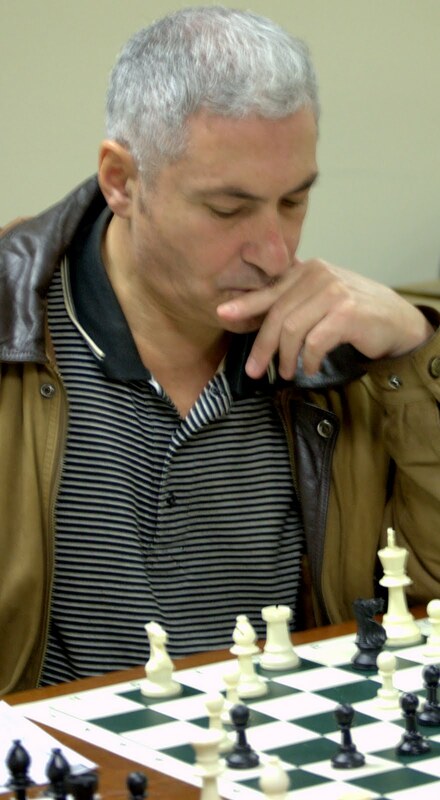 Under 2500 USCF senior life master Denys Shmelov gained a grandmaster norm at the Berkeley International Tournament, held January 2-8 at the Berkeley Chess School in Berkeley, California. The 24-year-old Pepperell, Mass. resident and 2008 Massachusetts state champion tallied 6.5-3.5 and tied for 1st Under 2500 in a field of 58 players. Among his victories were wins against IMs Robert Ris of the Netherlands and Sam Collins of Ireland, as well as GM Dejan Bojkov of Bulgaria. 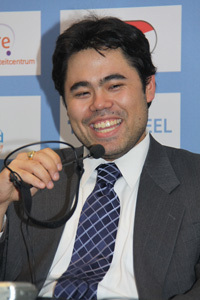 He drew GM Robert Hess of New York before defeating GM Sergey Erenburg of Israel in the penultimate round. In the final round, he faced tournament leader GM Loek van Wely of the Netherlands and lost. Van Wely finished first with a 8-2 score, while Erenburg took second place with a 7.5-2.5 tally. Third place with a 7-3 performance went to GM Magesh Panchanathan of India. Also scoring 6.5-3.5 and tying for 1st Under 2500 was IM Sam Shankland, a student at Brandeis University in Waltham, Mass. and a key member of the champion 2010 U.S. 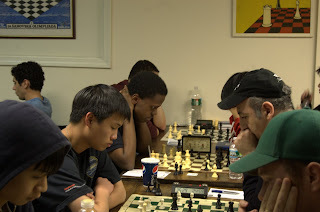 Chess League New England Nor''Easters team, who clinched his final GM norm. GM Josh Friedel, who was born and raised in Goffstown, New Hampshire also tallied 6.5-3.5 but finished out of the prize money. Photo credit: Anthony Cortizas Jr.
For an interesting take on the recent victory in the Women's World Chess Championship by Hou Yifan, see this article by Nicolas Kristof at the New York Times. Essentially, he argues that China's recent rise in chess is a fine example of the slow emergence of China's untapped talent pool in many areas of human enterprise. He also briefly recounts a friendly game he played with Yifan, but there is no game score. Some of the older members may remember Ed Wyckoff, who played regularly at the Boylston Club during the 70s. Ed died last Monday in Albuquerque, NM, after a long illness, leaving his wife, Anne, and son, Ed, jr. From 1972-1976, Ed was captain of the Boston Latin School chess team. He led the team to four straight Hurwitz Cups (MA high school team championship), as well as 3rd place (1975) and 5th place (1976) finishes at the US National High School championships. Ed graduated from Harvard College (AB, 1980) and a few years later moved to Albuquerque, where he served as a Financial Aid Officer at the University of New Mexico - first at the undergraduate college, later at the medical school. He was my best high school friend and a very decent man. The Wachusett Chess Club produces a video series called Chess Chat. The Chess Chat program on Keres has been viewed by more that 5036 viewers around the world. 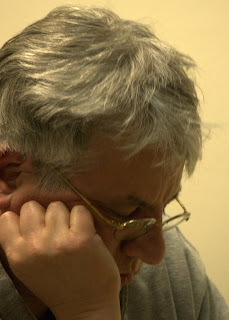 Susan Polgar posted it on her site. She also posted the program we did last month on Bent Larsen. That program has already nearly 6000 hits worldwide. We are planning to do next month's program on U.S. presidents that played chess. We did one a couple of years ago. But we have a brand-new one that has lots more information about chess-playing presidents. SHARON — Many New Year’s resolutions involve bettering ourselves. Sharon Middle School seventh grader Jordan Shapiro started his new year improving other people’s lives, hosting a fundraising chess tournament at Temple Sinai on Sunday. With his twin sister, Sarah, the two will celebrate a B’nai Mitzvah in March. Hosting the chess tournament was Shapiro’s way of completing his mitzvah project, which requires him to perform a good deed to help others. Proceeds from Sunday’s tournament benefited the Living Memorial Chess Fund of the Massachusetts Chess Association (MACA). All levels and ages of chess players were welcome to participate. MACA is an educational non-profit organization whose purpose is to promote chess in Massachusetts and represent the interest of chess players within the state. The Living Memorial Fund, through MACA, provides chess sets and boards to schools, libraries, junior chess clubs and other community groups. Nevertheless, Vigorito does admirably well in his efforts to explain typical plans, tactics, and strategies for both sides. This book is largely for an audience rated from 2000, or more likely 2200, and upwards. The lines are long, complicated, and often nearly impossible to understand, even with Vigorito as a guide. By itself this book is difficult to work with because it gives relatively little guidance in regards to repertoire choices. However, if you combine it with the below DVD by Gustafsson, you may have a winning combination. The Herb Healy annual Open House had a good turnout this year, with 39 in the rated section, 13 in the unrated section, and many visitors who came to watch the games and greet the new year with friends. FM Chris Chase won the rated section with 4.0.
split 2nd place with 3.5. Chris, of course, is the 2010 Boylston Champion. Justin came up from New York to play in the tournament and found his first opponent was Natasha. on New Year's day again -- the last time was in 1970 at the old YMCU on Boylston, when the new year's day event was known as the 30/30, before it was renamed in honor of Herb Healy. As usual, Bernardo Iglesias organized the open house and served as the able TD. Mike Griffin continued as master caterer. Mike also wanted to be sure to thank volunteers Seth Lieberman, Bill MacClellan, and Eric Godin who helped in various ways. Thanks to them all for a lot of hard work -- it is much appreciated. And thanks to all who came to start off the new year in a fine chess tradition. Happy New Year! May you all find good moves in 2011.